Received December 11, 2019; Accepted January 9, 2019.; Published online February 12, 2019. The first paper demonstrating the feasibility of profiling the transcriptomes of individual mouse blastomeres and oocytes captured by micromanipulation was published in 2009 (Tang et al., 2009)—1 year after the introduction of bulk RNA-seq (Lister et al., 2008; Mortazavi et al., 2008; Nagalakshmi et al., 2008). The early protocols for scRNA-seq were applied only to a small number of cells and suffered from a high level of technical noise resulting from inefficient reverse transcription (RT) and amplification (Ramskold et al., 2012; Sasagawa et al., 2013; Tang et al., 2009). These limitations of early protocols have been mitigated by two innovative barcoding approaches. 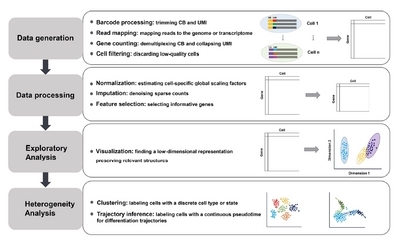 As scRNA-seq has become a well-established method for dissecting cellular heterogeneity in complex tissues, the associated computational tools necessary for analyzing single-cell transcriptomic data continue to be designed and developed. As of November 2018, 325 tools have been deposited at the scRNA-tools database (www.scRNA-tools.org), and the number of tools being added is growing exponentially (Zappia et al., 2018). Compared with the analysis of bulk RNA-seq, scRNA-seq data analysis has several unique features. First, the gene-by-cell count matrix is very sparse owing to inefficient capture rates of mRNA molecules and low sequencing depth per cell, which results in higher technical variability in gene expression across cells. Second, tens of thousands of single cells are analyzed in a typical single-cell experiment, whereas the number of samples in bulk RNA-seq is usually three per condition, highlighting the importance of computational efficiency in tools for analyzing scRNA-seq data. Third, since the type and state of each cell are generally unknown, the expectation is that such information will be inferred from scRNA-seq data through unsupervised analysis, such as visualization and cell type identification. However, for bulk RNA-seq data, in which the class label of each sample is known a priori, genes that are differentially expressed between classes are usually identified through supervised analysis and hypothesis testing. Finally, there are single-cell–specific biological questions that cannot be addressed by bulk-level analysis. For example, it is possible to infer how individual tissue stem cells differentiate into multiple lineages during tissue homeostasis by estimating the ordering of cells along differentiation trajectories from a mixture of cells with heterogeneous differentiation states. The workflow of scRNA-seq data analysis includes four steps: data generation, data preprocessing, exploratory analysis, and heterogeneity analysis (Fig. 1). Fig. 1. Computational workflow for analyzing scRNA-seq data. Alquicira-Hernandez, J., Nguyen, Q., and Powell, J.E. (2018). scPred: scPred: Cell type prediction at single-cell resolution. bioRxiv, 369538. Buttner, M., Miao, Z., Wolf, A., Teichmann, S.A., and Theis, F.J. (2017). Assessment of batch-correction methods for scRNA-seq data with a new test metric. bioRxiv, 200345. Lun, A., Riesenfeld, S., Andrews, T., Dao, T.P., Gomes, T., and Marioni, J.C. (2018). Distinguishing cells from empty droplets in droplet-based single-cell RNA sequencing data. BioRxiv, 234872. McGinnis, C.S., Patterson, D.M., Winkler, J., Hein, M.Y., Srivastava, V., Conrad, D.N., Murrow, L.M., Weissman, J.S., Werb, Z., and Chow, E.D. (2018). MULTI-seq: scalable sample multiplexing for single-cell RNA sequencing using lipid-tagged indices. bioRxiv, 387241. Mclnnes, L., Healy, J., and Melville, J. (2018). UMAP: uniform manifold approximation and projection for dimension reduction. arXiv. Parekh, S., Ziegenhain, C., Vieth, B., Enard, W., and Hellmann, I. (2018). zUMIs: a fast and flexible pipeline to process RNA sequencing data with UMIs. Gigascience. 7. Schiebinger, G., Shu, J., Tabaka, M., Cleary, B., Subramanian, V., Solomon, A., Liu, S., Lin, S., Berube, P., and Lee, L. (2017). Reconstruction of developmental landscapes by optimal-transport analysis of single-cell gene expression sheds light on cellular reprogramming. bioRxiv, 191056. Tabula Muris, C., and Overall, c., Logistical, c., Organ, c. p.,, Library, p. s.,, Computational data, a., Cell type a., Writing, g., and Principle i (2018). Single-cell ranscriptomics of 20 mouse organs creates a Tabula Muris. Nature. 562, 367-372. Wolf, F.A., Hamey, F., Plass, M., Solana, J., Dahlin, J.S., Gottgens, B., Rajewsky, N., Simon, L., and Theis, F.J. (2018). Graph abstraction reconciles clustering with trajectory inference through a topology preserving map of single cells. bioRxiv, 208819.